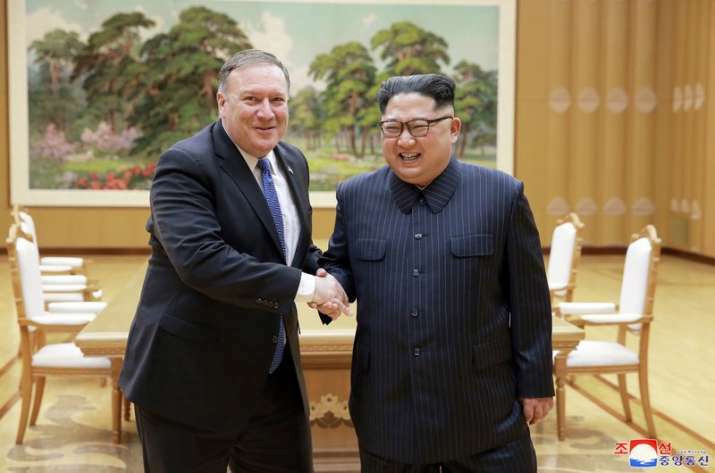 In this May 9, 2018, file photo provided by the North Korean government, US Secretary of State Mike Pompeo, left, poses with North Korean leader Kim Jong un for a photo during a meeting at Workers’ Party of Korea headquarters in Pyongyang, North Korea. 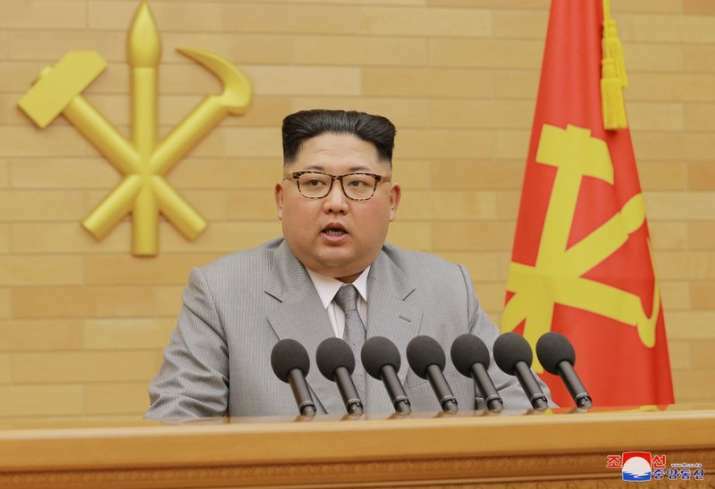 In this photo provided by the North Korean government, North Korean leader Kim Jong un delivers his New Year’s speech. Jan 9: North and South Korean officials meet at a border village and agree on North Korea sending athletes and delegates to the Winter Olympics in the South. 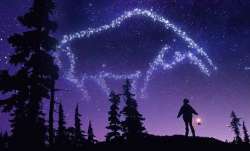 Hundreds of North Koreans go to the Pyeongchang Games in February, including Kim’s sister, who conveys her brother’s desire for an inter-Korean summit with South Korea’s president. March 5-6: South Korea’s presidential national security director Chung Eui-yong visits Kim in Pyongyang and reports that Kim is willing to discuss the fate of his nuclear arsenal with the United States. 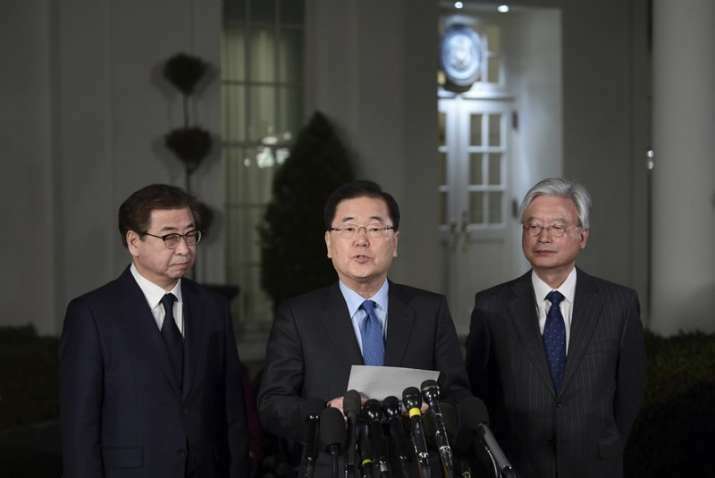 South Korean national security director Chung Eui-yong, center, speaks to reporters at the White House. April 18: Trump confirms that Mike Pompeo, then the CIA chief, had met Kim secretly in North Korea and said “a good relationship was formed” heading into the anticipated summit. May 7: Kim meets Xi again in China and calls for stronger strategic cooperation between the traditional allies. 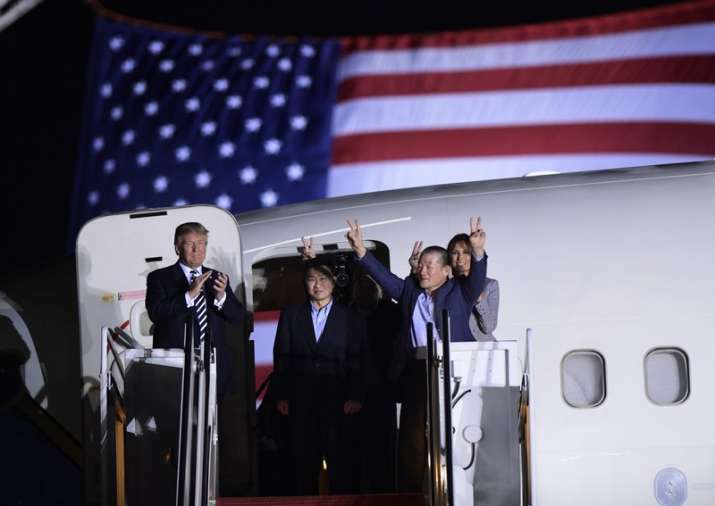 US President Donald Trump, from left, greets Tony Kim, Kim Hak Song, seen in the shadow, and Kim Dong Chul, three Americans detained in North Korea for more than a year, as they arrive at Andrews Air Force Base in Md. 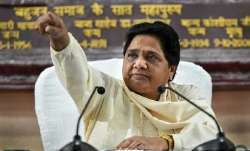 May 16: North Korea abruptly cancels a high-level meeting with the South and threatens to cancel the summit with Trump too in protest over US-South Korean military exercises and US comments that the North should follow the “Libya model” of denuclearisation by eliminating everything upfront. 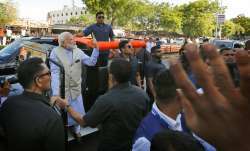 The North says it won’t be unilaterally pressured into abandoning its nukes. 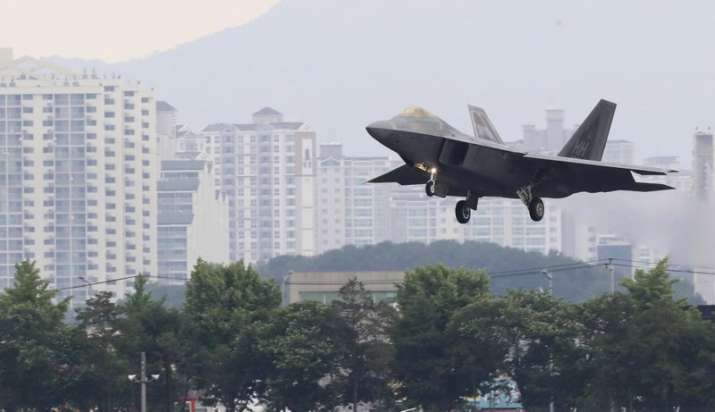 A US F-22 Raptor stealth fighter jet lands as South Korea and the United States conduct the Max Thunder joint military exercise at an air base in Gwangju, South Korea, on May 16. May 22: Trump and Moon meet at the White House to discuss the Trump-Kim talks. 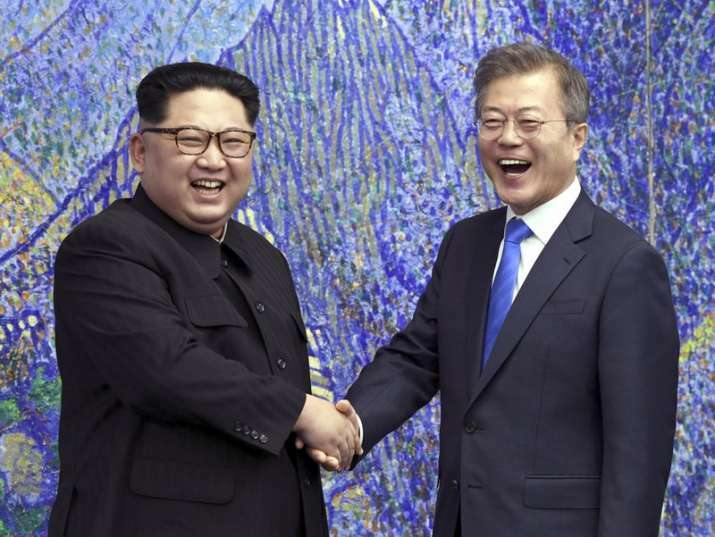 The South Korean president says the “fate and the future of the Korean Peninsula hinge” on the meeting in Singapore. 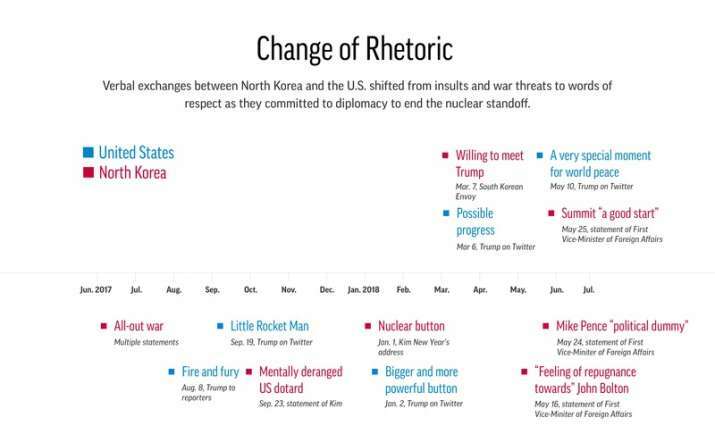 May 25: North Korea attempts damage control, saying it is still willing to hold talks with the United States “at any time, (in) any format.” Moon calls Trump’s move to cancel the summit “very perplexing” and says Washington and Pyongyang should get the talks back on track. June 5: White House Press Secretary Sarah Huckabee Sanders tweets the Trump-Kim meeting will be held at Singapore’s Capella Hotel.